The new Jesus and Mo strip, called “born,” is a bit convoluted, and to my mind is not as funny or incisive as some previous strips. 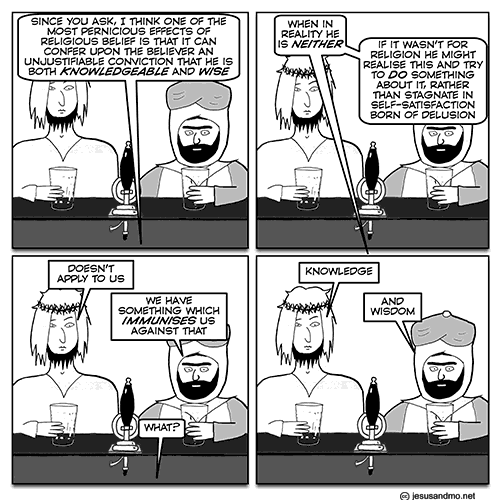 However, Jesus and Mo has been going for 13 years, so the artist is allowed to have an off day. In honor of the strip’s 13th birthday on Friday, the artist is offering a signed print of any J&M strip of your choice if you donate at the $4/month level or above. You can do so at the Jesus and Mo Patreon site, and specify in an email or Patreon message which strip you want (there’s a contact form on the J&M website). This entry was written by whyevolutionistrue and posted on November 21, 2018 at 10:00 am and filed under Jesus and Mo. Bookmark the permalink. Follow any comments here with the RSS feed for this post. Both comments and trackbacks are currently closed. I think in Islamic texts it reminds people to wash. That’s not a bad suggestion. I wonder, though, if in desert countries they were able to find sources of water. As I understand it, the recipe was lost, and it took many centuries before someone hit on it again – I think after the Middle Ages. Ummm, Groucho? Or some other Marxist? I think it’s really good too. Different cartoons are always going to appeal to different people is different ways. There are some Jerry really likes that don’t appeal to me as much as this one. If we were all the same etc. … Jesus and Mo has been going for 13 years, so the artist is allowed to have an off day. Even Caruso sang an off note on occasion, I bet. Author’s an international treasure (at least everywhere outside freakin’ Pakistan). “Knowledge” , “and Wisdom” and insufficient data for a meaningful answer. In an entirely different way, a religion that says you are NOT wise can have pernicious effects, because it leaves the flock open to brain-washing by an authoritarian leader. Furthermore, a religion which says that the wisdom it imparts is essential to salvation is especially pernicious as is any religion that claims that it alone is a source of its wisdom. By contrast, a religion which merely promotes wisdom for its own sake, and believes that its wisdom is more or less publicly verifiable is somewhat less pernicious.